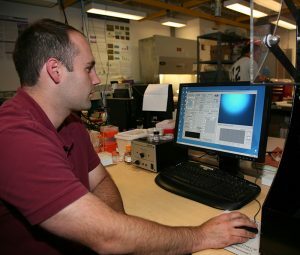 SUNY Polytechnic Institute (SUNY Poly) announced today that Professor of Nanobioscience Dr. Nate Cady has been awarded $1,768,000 in funding from the Rome-based Air Force Research Laboratory (AFRL) to enable future generations of computing systems by using memristors (or “memory resistors”), which are nanoscale electronic switching devices that act like synapses in the human brain. This will allow Dr. Cady and his research team to fabricate an overall hardware architecture and capability which can lead to computing that can be as much as 1,000 times as powerful as is currently available. Supporting educational opportunities for a number of SUNY Poly students, this research will leverage the institution’s world-class 300mm and 200mm fabs and research labs, in order to provide neuromorphic computing power that meets stringent Air Force requirements for applications such as unmanned aerial vehicles (UAVs), aircraft, satellites, and other deployable autonomous systems. As a result of this increased computing capacity, these neuro-inspired computer architectures may be particularly well suited to handle problems requiring techniques and systems that can capture knowledge from an abundance of data. For example, they could be highly relevant for advancing the internet of things, as well as a number of deployable, autonomous systems by capitalizing not only on its computing power but also by seeking approaches that lead to low-power, reconfigurable, high-efficiency brain-inspired computing capabilities. Furthering SUNY Poly’s hands-on approach to providing targeted, high-tech education, Dr. Cady’s research will support a SUNY Poly Postdoctoral researcher and graduate students, as well as a number of undergraduate students who will be able to learn first-hand how to develop and fabricate the memristive neuromorphic structures. More specifically, researchers will focus on addressing resource-constrained systems with limited size, weight, and power through the use of these lightweight neuromorphic networks. This will be achieved by leveraging SUNY Poly’s ongoing work on memristive dynamic adaptive neural network arrays (mrDANNA), where optimally performing neuron/synapse configurations will be selected and a fully functional memristive neuromorphic processor will be fabricated. This device will be capable of efficiently implementing command/control, navigation, and avoidance, as well as other spatiotemporal data processing applications. During this three-year grant, Dr. Cady’s research team will also collaborate on certain aspects of this research with The University of Texas, Knoxville. This follows an announcement in Fall 2018 that Dr. Cady was awarded $500,000 in funding from the National Science Foundation to develop advanced computing systems based on a novel approach to the creation of non-volatile memory architecture.